Part two of the insider view of negotiations between Greece and the Eurogroup. When is a rescue not a rescue but a seizure of assets? Interview. Renegotiating international bailout, February 5, 2015. Demotix/ Bjorn Kietzmann.All rights reserved.From February through July 2015, James K.Galbraith was advisor to the Greek Minister of Finance, Yanis Varoufakis. JG: The evidence is very clear: the creditors are not interested in whether the Greek state gets money for privatizations. This did not interest them. Had it done so, they would have paid attention when the Greek government, in February-March, said that they wanted to have a rational privatization policy rather than putting everything on the auction block at once. They are clearly not interested in that. What they are interested in is whether the assets pass into the hands of German construction companies, international hotel chains, international pharmacy chains and you can go down the list. That is clearly the agenda. State funding from privatizations is irrelevant. If you look at the goals for privatization revenues in the previous versions of the program, actual receipts did not come within a tiny fraction of the funds that were projected to be raised. Add the fact, moreover, that these policies failed to raise money, failed to produce growth, failed to produce employment, and that this has been going on for five years and has made no difference to the way the creditors approach the policy regime, no difference at all. It is clear on the evidence that the creditors are indifferent to the outcomes so far as Greece is concerned. LM: Will Greece end up out of the euro? JG: Somebody will be out of the euro at some point, because the politics of the choices here have now become exceptionally clear. SYRIZA came with the hope that it would be possible to negotiate a realistic economic deal inside the euro, and the evidence is now clear on that point. What we have seen, in effect, is an unethical experiment imposed on Greece. An experiment that proved to have enormous human cost and those who imposed it are utterly unwilling to face the consequences of their actions. LM: If so, the policies imposed on Greece are merely a way to plunder the country. What then is the European institutions’ logic? JG: I think one has to understand that the governing institutions here are not benign dictators acting in the general interest of the European population. First of all, they are acting at the direction of certain particular governments. Secondly, they are acting in the interest of their own institutional powers and, thirdly, in some cases to serve the political objectives of the people who are leading them. On the third point I’ll give you two examples. In 2010, the IMF came into the Greek loan, the largest in the history of the IMF in relation to quota, and the reason it did was that Dominique Strauss-Kahn wanted to curry favor with the French bankers because he wanted to become president of France. That was a personal political objective that basically subverted the mission of the International Monetary Fund. Jean-Claude Trichet again bought Greek bonds for the European Central Bank, to curry favor with the French bankers - not because it was in the interest of Europe, nor in the interest of the ECB. On the second larger question, institutional power, it was clear that the ECB and others, but in particular the ECB, were furious that the Greek government had the temerity to impose limitations on the activities of the troika’s bureaucrats in Athens. That was just an act of impudence which they were determined to override and eventually they did override it. What came up again and again was the question of whether the European Central Bank or the Greek government controlled what happened in the ministries of the Greek government in Athens. On the first point, I do not think that it is a secret that, in 2010 and later, the governments of France and Germany acted first and foremost in the interests of their own banking sector. That is where their political base is and their concern for what happened in Greece was secondary or nonexistent. LM: If you are correct, then there is little room for a sensible advance in the European project? JG: It would have to come from a political movement that transcends the boundaries of individual countries, particularly crisis countries, and that extends particularly to France and Germany. Without such a movement, without a real transformation at the level of the politics of those countries, you could expect that their governments and the entities that they exercise influence over will continue to behave as they have. JG: It is clear enough that there was no interest in the program of the Modest Proposal, which was designed to remedy the crisis within the framework of the European treaties. The fact that sensible solutions which are available are not being taken up, simply means that more difficult and risky measures will be taken at some point later. At some point some country is going to make the decision that it really is impossible to achieve an effective transformation inside the euro and will take the jump and leave. At that point the course of history will change. That country might not be Greece, which is beaten down at this point, but it could be Ireland for example. JG: Ireland comes to mind because its trading partners are the United Kingdom and the United States, not continental Europe. So its membership of the euro was somewhat incidental and it could very well decide that it is in its best interest to go back to the Irish Pound. LM: What about Spain? The country is growing, domestic demand is rising, and even the construction sector is gaining momentum. Spain is being presented as an example of the austerity now – supply-side policies later success. JG: Spain is a much larger and more powerful country than Greece and it underwent a much milder adjustment. Spain has some policy flexibility that Greece doesn’t have. But I think that the test of the extent to which Spain has that flexibility will come later. When the Spanish government tries to bring Spain back up to a decent level of employment, for example, that would be a real test of the extent to which a larger country can bend the system. There may be, as you say, some positive indicators, but that partly goes against the reality that Spanish unemployment remains enormously high. 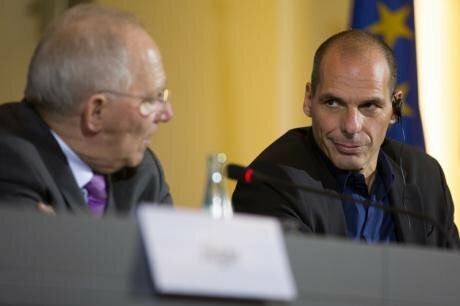 LM: Looking back at your experience as advisor to Yanis Varoufakis while he was Greece’s Minister of Finance, do you think you miscalculated your options at the negotiations? JG: No. The first thing that Yanis said to me when I arrived in Athens on the 8th of February was “welcome to the poisoned chalice.” We were under no illusions from the very beginning. People have been saying that we were, but they were not there at the time. We knew the Greek government had a very weak hand and that all it could do was to put its case before the European institutions and see if there was any openness to a rational argument. We could not threaten with anything, for that would have been totally counterproductive. There were strategies, both of which were tried, of being somewhat confrontational, or of being somewhat concessionary, but it made no difference. What we had to do was to test whether rational argument could prevail in those circles, and that required making those arguments persistently over time, which Yanis did with great skill. So I don’t think he was under any illusion and I don’t think he miscalculated, but I think that proving what the troika and the creditors interests really were was something that had to be done, and that required time, good faith and effort. Unfortunately there was no good faith on the other side. LM: And knowing what you know now? JG: If the world had known in February what we knew, then things might have been different, but the world had to be persuaded of that. Had Greece taken the exit ramp on the 28th of January the world would have condemned the Greek government for reckless action and for not negotiating. We knew that it was not an option. Nor was it a policy of the Greek government. Even if it had been, it would have not been viable in the larger political context. 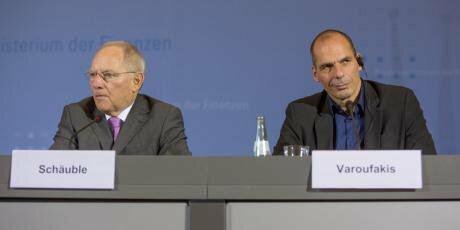 LM: Then German Finance Minister, Wolfgang Schäuble, tabled his “temporary Grexit” idea, which pretty much put an end to all discussions, no? The Greek strategy was to kick the decision level up to Chancellor Merkel in the hopes that she would think of larger politics, that the US would play a role, and that she would say to Minister Schäuble “you’ve got to cut some slack.” In the end she did not do that and adopted the policy of pushing the Greek government to accept the Memorandum as it was. LM: And yet, there were France, Italy and other countries that could have created a more level playing field. Is German dominance so great? JG: It’s fair to say that the French and the Italians were more sympathetic to the Greek position without being effective advocates for it. Everybody else, of course, was hostile. You are pointing to an important point, which is that Italy and France are countries which are big and powerful enough to make a difference if they really choose to exercise their interest. Their problem has been an unwillingness to do that. Politics in both countries should be clarified by what just happened in Greece and people should recognize that if you want to preserve any element of national autonomy you have to be prepared to fight for it. LM: Are you surprised that the US was not as supportive of Greece as some would have expected? It seems that when Timothy Geithner was US Secretary of the Treasury the American position was stronger. JG: US Treasury Secretaries for some time have not carried very much weight in Europe and this was true of Tim Geithner who, certainly on that issue, was on the right side, and this is probably true of Jack Lew. The President, on the other hand, did make a number of telephone calls to Chancellor Merkel urging a pragmatic solution. I’m not sure that was not helpful, it probably was helpful to a degree. But at the end of the day the role the US could play on a question internal to the eurozone was limited. I think everybody recognized that. If it comes to a more serious confrontation, I think the US role would be enhanced potentially, but it simply did not get there in the Greek case. If you talk about Greece, Spain, Portugal, you are talking about important American allies and their interests would weigh quite heavily in any American calculation. If the crisis touched the integrity of the euro zone the US would have to rethink its position. Let’s put it this way: the US has always been a believer and supporter of, first of all of Europe, but secondly of the euro and the eurozone. I think that if it became clear that the survival of a united and effective Europe depended upon changing the currency arrangement, then the US would eventually, after great regret and difficulty, be obliged to rethink its position about the euro. Because, obviously, the European Union is a more important entity than the currency arrangement you have in any given time. After all, how many times have currency arrangements changed in the last century, four or five times? These are not necessarily immutable things however much we pretend that they are. LM: So after being both an observer and a participant in the eurozone’s latest affairs, what’s your faith on the single currency? JG: It has greatly diminished, I can tell you that. I think that it is clear that the eurozone is not being run on principles that are viable economically for the countries in the periphery: so something has to change. It is pretty clear that the direction of change is not going to go in the preferred direction, which is the one laid out by Yanis, Stuart Holland and myself that involves the strengthening the economies of the peripheral countries within a unified framework. That is forcing the left in Europe to reconsider its commitment to the European economic framework that presently exists. It is clear that some change in the arrangement is imperative and which direction it goes in depends on whether there is any vision at all at the center. At the moment there is no sign of it. The Greek case shows there is nothing but the narrowest and most myopic and special interest-oriented vision of how to handle these issues. An economic policy that consists in the asset-grabbing of the public sector and the private sectors of the debtor countries is not one which is going to be taken up very happily by the populations of those countries. LM: Things almost looked promising six months ago and now it is looking grim for the Greek people moving forward. JG: That is how the situation looks at the present moment, for sure. But I think the Greek people were very brave and made an important effort in a way that deserves a lot of credit for having been sensible and measured, and for having supported their government through a very difficult period. They deserve a better outcome than they got. At the Federal Ministry of Finance in Berlin, February 5, 2015. Demotix/ Bjorn Kietzmann.All rights reserved.